How much income tax might be due if you take a lump sum from your pension? The amount you take out will be added to any other income you have and taxed at the highest rate of income tax you pay. This calculator gives you an idea of how much extra tax could be due and the value of your lump sum after tax. In calculating the tax, it uses the standard personal allowance and respective income tax bands for a whole tax year. However, the full personal allowance and respective tax bands may not be available at the time a withdrawal is made. For example, in the first month of the tax year, April, only 1/12th of the personal allowance and tax bands are available, regardless of the amount of the lump sum. This may result in a disproportionate amount of tax being deducted which can be reclaimed from HM Revenue & Customs directly. Are you taking the lump sum from an existing drawdown plan? This should be the gross value of the lump sum you intend to take. This should be your gross annual earned or pension income, including any state pension or taxable benefits. 25% of a lump sum taken from a pension not already in drawdown will normally be tax free and the rest taxable. 100% of a lump sum taken from a drawdown plan will be taxable. This calculator only provides you with an indication of the tax you may have to pay based on rates and allowances which apply to the 2019/20 tax year. It takes into account income related personal allowances, but otherwise assumes a standard £12,500 personal allowance. It also assumes all income is employment or pension income. The actual tax deducted from any payment will depend on the tax code specified by HM Revenue & Customs. 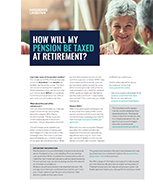 The calculations assume that 25% of any lump sum from a non-drawdown pension is available tax free. If you have reached age 75 and have insufficient lifetime allowance, this percentage will be lower. In some circumstances, you might not be able to withdraw a lump sum without moving into drawdown first. The calculator does not confirm that such a lump sum is available to you, nor does it consider any implications of taking this lump sum, for example any impact on capital gains tax, inheritance tax or on any means tested benefits. If you're unsure, please seek professional advice. If you are yet to take a payment from your pension you may find the first payment has tax deducted using an emergency tax code. Use our emergency tax calculator to see how much tax might be deducted from your pension withdrawals under emergency rate tax.